We are licensed in the State of Michigan as Residential Home Builders (License #2102211031). We carry both liability and workers compensation insurance and will provide copies of the policies when requested. Our pricing is very competitive. We match high quality materials and superior craftsmanship to provide our customers with an exceptional final product. We are Trex Pro Platinum Certified Installers with over 15 years of construction experience. We have built hundreds of decks in the Southeastern Michigan Area. We have also completed a multitude of other construction projects including; custom home framing, additions, enclosed porches, wood and cement board siding, basement finishing and commercial remodels. We offer a variety of hassle free finance options. Our application process is easy and we walk you through it step by step. Our Project Managers provide their cell phone numbers making them easily accessible to discuss any questions or concerns. References are available upon request. Referrals and repeat customers have allowed us to prosper in times of economical hardship. We are in business to stay in business. All jobs will be permitted and inspected by the local building inspector. 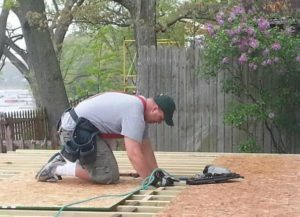 Once an estimate is accepted, a State of Michigan certified designer will review all deck designs to ensure that all loads, spans and lumber dimensions meet or exceed building code requirements. This is done for you and your family’s safety. I hope this gives you some guidance and comfort in making the right choice for your project.